What draws us to cars? Is it speed? Piloting a machine? Smooth lines? Maybe you’re inspired by watching Formula 1 drivers race around curves at 200 miles per hour. Whatever it is, we almost can’t help being drawn to them. Ferrari owns a special place in the minds of many drivers. Do you remember the first time you saw one? There’s a good chance you might have played with a matchbox or model Ferrari as a child. Perhaps as you got a little older and heard rumors of how much they cost, the dream of driving one faded away. We’re here to let you know that Ferrari can actually be one of the more affordable supercar brands. It will still cost more than a general consumer car, but it’s not as crazy as you may think. We put together a handy car loan payment calculator with several luxury cars preprogrammed to have fun with. First, let’s talk about the “pie-in-the-sky” route. We’re looking at a 2019 Ferrari 812 Superfast, a car that boasts a 211 mph top speed and a price tag of $315,000. Obviously, it’s gonna take some cash and good credit to own something like that. Think of it like owning a second home, but instead of paying it off in 30 years, you’re doing it in under 8. If we take an average loan term (60 month loan with 4.21% APR), your monthly payment will be $5,831. That’s a good chunk of change, and it’s likely the Ferrari wouldn’t be your first supercar in this scenario. Now let’s look at a more realistic way you can enter the Ferrari family. A 2012 Ferrari California Roadster can be had for just under $100,000. That’s half of what a 2018 model sells for, and since most Ferrari owners drive them conservatively, the mileage can be under 15,000. Payments for this car, with no money down, and 4.21% APR for 60 months, will be $1,851. Now that’s a number that is a lot more manageable. (The APR can affect your payment and total balance a lot, which is why it’s a good idea to look around for the best auto loan rates you can get). Typically, the value of a new Ferrari will decrease by $100,000 after about three years in the market. That’s why used Ferraris present so much value. The price has gone down significantly, but it’s still a full-blooded Ferrari. Another car that comes in just under $100k is the 2007 Ferrari F430. This has more of the classic Ferrari look that we all know and love. Models with low mileage will cost a bit more, but moderate mileage is only going to be around 25,000 anyway. It’s useful to try to stay under the $100,000 mark not only to save money, but because many lenders won’t lend over that amount. At the time of this article, there are 293 Ferraris under $100k on Autotrader (and scrolling through will reveal gems as low as $50,000). So there’s plenty to choose from. 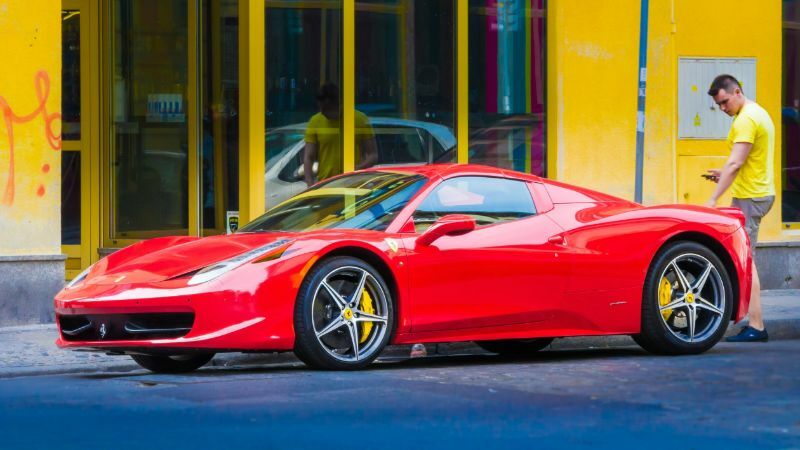 Maintaining a Ferrari is going to cost more than something like a Camry, of course. But depending on the model, it might not be as much as you think. There are rumors of $10,000 oil changes, but unless you have a limited edition model, it won’t be anywhere near that. Oil changes on Ferraris start at $400, tires at $1000, and belts are around $4000. If you’re seriously considering owning one of these cars, you should be prepared to pay 5-10 thousand per year on maintenance. But that is way less than maintaining a Lamborghini, where even oil changes start at $2000. Another reason to consider a used Ferrari is that new Ferrari dealerships are very selective about who they let purchase a vehicle. If you’re under 40, or haven’t owned a Ferrari before, it can be very hard to walk away with a new car. Ferrari is a luxury manufacturer, and just showing up with cash isn’t enough for them to let you in the club. If used prices still seem out of reach, there’s good news. You can actually just buy a part of a Ferrari. This is possible with fractional ownership. It works just like a timeshare. Most companies who provide fractional ownership of supercars charge a membership fee and an annual car package fee. The membership fee can start at $1,000 and cover multiple years, and the car package fee starts around $6,000 for the year (paid monthly). Owning a supercar package with a car share company will allow you to drive the car of your choice for a specified amount of time per year, usually 4-8 weeks. It might seem like a short amount of time, but you probably wouldn’t drive your Ferrari to work every day anyway. Another huge perk of this arrangement is maintenance. You don’t do it. They do. The fractional car company keeps all their cars maintained and will even go as far as delivering the car with a full tank of gas to your location. Doesn’t that sound like a good deal? You can rev up an Italian V8 engine to 8500 RPM without the headaches of planning and paying for maintenance. Whether you go full throttle on a used vehicle, or share ownership with others, there’s a way to own your dream Ferrari that is closer than you think. Let us know what you think in the comments. Is it more or less than you expected? Like and share if you found the article interesting! We’ll be forever grateful.